“Every year brings its share of challenges and triumphs, but by and large, 2016 was a terrific year for Epilog Laser. Not only did we expand our team, but expanded our product line, all of which helped us achieve record sales this year." Golden, Colo. (Dec. 21, 2016) – As we prepare to head into 2017, we at Epilog Laser always enjoy looking back over the exciting announcements, events, and accomplishments we’ve experienced over the past 12 months. Here are some of the highlights from 2016. A year of expansion – In 2016 Epilog was excited to celebrate the grand opening of our European Support and Distribution Center in Houten, Netherlands. The new European headquarters for Epilog will allow us to provide even better support to our customers throughout Europe. Worldwide, Epilog welcomed 29 new employees, including a chief financial officer, web and graphic designers, support technicians, and additions to our engineering and production teams, all of which contributed to Epilog reaching record sales in 2016. Our distributors also saw great expansion as both Fairway Laser Systems and Prism Sales moved their headquarters to larger facilities that allow them to better serve customers with larger demo areas, as well as training and education spaces. A year of innovation – This year Epilog was excited to launch our new galvo laser system, the Epilog G2! This is the first galvo laser system that can laser mark over a large work area without compromising engraving quality or requiring product indexing. The G2 is a pulsed fiber laser that engraves at remarkably fast speeds over an adjustable engraving area that spans up to an impressive 24” x 24” area. A year of making - Epilog sponsored at each of the flagship Maker Faires in San Mateo and New York City, as well as the National Maker Faire hosted in Washington D.C. In addition to our corporate presence, several of Epilog’s distributors participated in local mini-Maker Faires across the country. We also sponsored the second annual Makerspace Contest hosted on instructables.com, donating a 40-watt Zing 24 Laser as the grand prize. And we’re currently running the eighth installment of the Epilog Challenge, also hosted on Instructables. One lucky maker will take home a 30-watt Zing 16 for this popular contest! 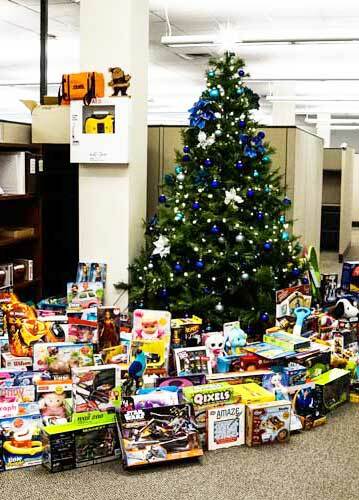 A year of giving - We’re excited to say that with generous donations from Epilog ownership, Epilog employees, and our friends at Colorado 811, this holiday season we raised an impressive $1,589, which we used to purchase over 200 toys for the Santa Shop at The Action Center. The Santa Shop is a week-long program that takes place in mid-December allowing low-income families in Jefferson County, CO. to choose Christmas presents free-of-charge, which enables parents to use their limited resources for things like utilities, food and rent. We were also excited to send an additional monthly cash donation for ongoing needs at The Action Center throughout the year. With the New Year just weeks away, we can’t wait to see what 2017 brings. We’d like to extend our sincere thanks to you - our customers, friends, fans, and associates - for your support in helping make 2016 an incredible year for Epilog Laser. Merry Christmas, happy holidays and best wishes to all for a peaceful and prosperous new year.